Last year the BBC World Service’s business department produced a series of highly politicised reports concerning the economy in the Gaza Strip. Notably, the BBC appears to be less interested in reporting some recent good news on the Gaza economic front. To date there has been no BBC reporting on that story. As readers are aware, Roger Hearing and Marie Keyworth from the BBC’s business department recently produced a series of reports (see related articles below) for BBC World Service radio which purported to inform BBC audiences worldwide about the state of the economy in both the Palestinian Authority controlled areas of Judea & Samaria and the supposedly PA controlled – but in fact Hamas-run – Gaza Strip. Though high on pathos and politically motivated messaging, the duo’s reports from the Gaza Strip notably made no mention whatsoever of one particular factor which has recently led to rising prices. “The Hamas government in the Gaza Strip has instituted new taxes that will be used to pay the salaries of its administration officials, who number approximately 40,000. Hamas, which declared the taxes under the heading “social solidarity,” decided to begin collecting them following a meeting of its parliament members who live in Gaza. The new taxes are also constantly changing. One tax that was instituted recently requires companies registered with the Economic Affairs Ministry in Gaza to pay approximately NIS 500 to have a Hamas representative participate in a company conference. Hamas charges another few hundred shekels to have the conference registered, and if it is postponed, the postponement is taxed as well. The most problematic taxes are levied on all goods that enter the Gaza Strip through the Kerem Shalom border crossing. Even cartons of cigarettes that are brought in from the West Bank are taxed. This means that the average resident of Gaza pays more for cigarettes than his counterpart in the West Bank does, even though the standard of living in the West Bank is higher. “The PA has been paying monthly salaries to nearly 70,000 public servants in Gaza despite the fact that the workers had not been allowed to serve in their positions since Hamas took over the Strip by force in 2007. The Palestinian Authority refused to pay Hamas’ 40,000 employees and payment of those salaries appeared among the demands laid down by Hamas as conditions for halting the conflict with Israel which it initiated last July. Back in July 2014 the BBC’s Yolande Knell produced a dumbed down report on the economy in the Gaza Strip which misrepresented the story of those 40,000 Hamas employees and now BBC Business reporters have ignored the issue of the price rises caused by taxes intended to pay their salaries. Once again we see that factors affecting the Palestinian economy which are the result of Palestinian decisions interest the BBC considerably less than any Israeli actions. 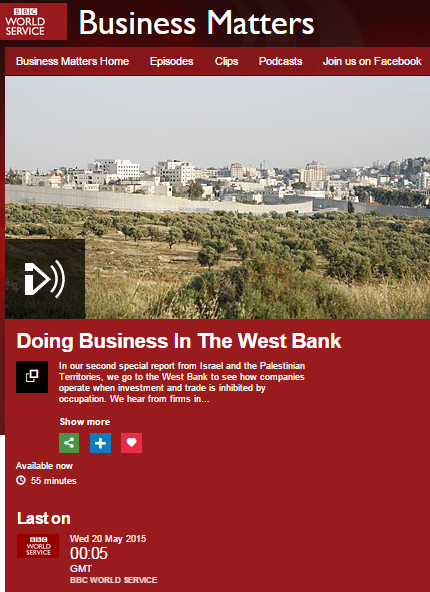 In addition to the two parts of the report aired in the May 20th edition of the BBC World Service radio programme ‘Business Matters’ which have already been discussed on these pages (see here and here), the segment included a report (also promoted as a separate clip) from Bethlehem by Marie Keyworth. The synopsis to the separately promoted clip – titled “Making Ends Meet In The West Bank” – promotes the same inaccurate claim about roads made by Roger Hearing in his introduction to the segment. As we noted here earlier, the vast majority of routes are completely open to use by all, with PA registered vehicles excluded from less than 15 kms of roadway in Judea & Samaria. She then goes on to interview someone she introduces only as “Sam Bahour – a Palestinian-American businessman”. As readers are no doubt aware, the BBC’s editorial guidelines on impartiality stipulate “the importance of clearly summarising the standpoint of any interviewee where it is relevant and not immediately clear from their position or the title of their organization” but Sam Bahour’s affiliations and political activism get no mention from Keyworth. BBC World Service listeners, however, know nothing of all that: instead Marie Keyworth leads them to believe that Israel is ‘punishing’ the Palestinians. Like the other sections of this programme, Keyworth’s report conforms to a specific political narrative and has a very obvious agenda. Once more listeners are left with a take-away message which includes only passive Palestinians exempt from any responsibility for their past and present decisions which have affected their lives and their economy. Whilst that certainly makes for nice, simple story-telling, it does not fulfil the BBC’s public purpose remit of building “a global understanding of international issues” by providing audiences with an objective, impartial, factual and accurate portrayal of the Palestinian economy. 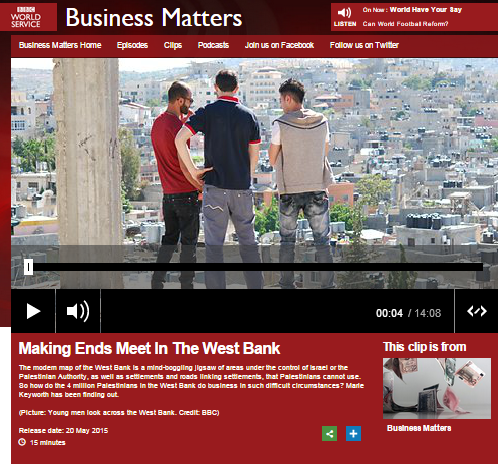 The May 20th edition of BBC World Service radio’s ‘Business Matters’ devoted roughly half its content (from 26:39 here) to the topic of “Doing Business In The West Bank” and, in addition to the interview with a World Bank representative discussed in a previous post, listeners heard presenter Roger Hearing introduce that segment of the show with the following words. As ever, BBC editorial guidelines on impartiality are breached as Hearing fails to inform listeners even of the existence of legal opinions which differ from the one exclusively quoted and promoted by the BBC. The context of how that “jigsaw” came about is erased from Hearing’s account with no mention of the fact that the recognized representatives of the Palestinian people agreed to that arrangement when they signed the Oslo Accords two decades ago. Not only does Hearing fail to clarify that the “areas under the control of Israel” (Area C) are not separate from the “settlements” as his words imply (all Israeli towns and villages are located in Area C and Israel has security control only in Area B) but his claim that Palestinians cannot use “roads linking settlements” is inaccurate and misleading. The vast majority of roads in the region are open to use by all motorists: even the political NGO B’Tselem acknowledges that in the region to which Hearing relates, as of March 2015, vehicles with PA number plates were excluded from travel on just three sections of road totaling less than 15 kms. Hearing of course neglects to point out that Israelis cannot use the roads in Area A – the parts of the region under Palestinian Authority control to which Israelis are forbidden entry. Hearing fails to comply even with his own organisation’s style guide when he describes an “Israeli security wall” which is in fact 97% fence: the approved BBC term is in fact “barrier”. He also fails to note that the fence includes agricultural gates specifically designed to enable farmers to reach their land. Refraining from supplying his listeners with any independent portrayal of the context of the frequent attacks against Israeli civilians travelling on roadways in Judea & Samaria during the second Intifada and the suicide bombings originating from that area which plagued Israeli towns and cities during those years, Hearing also fails to provide the all-important context of the current security threats which mean that measures such as the anti-terrorist fence and checkpoints – whilst significantly reduced in recent years – are still necessary. Instead he adopts the standard “Israel says” formula in his nod to BBC requirements of ‘impartiality’. 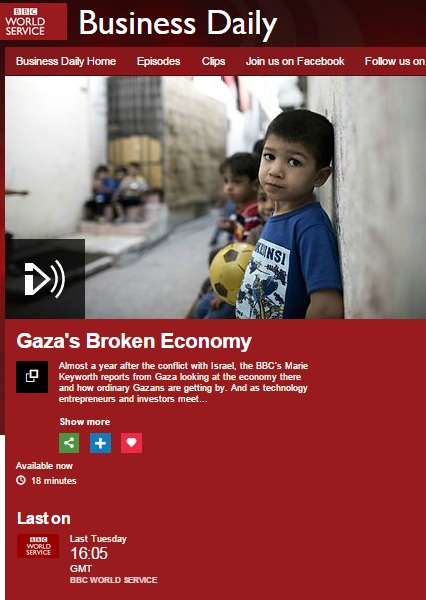 Just as Hearing’s introduction to the part of this series relating to the Gaza Strip provided a revealing glimpse into the ‘BBC World View’, this monologue also shows how the adoption of a specific political narrative dictates the type and quality of information provided to audiences and compromises the BBC’s adherence to its own editorial guidelines on accuracy and impartiality. Twenty years ago the internationally recognised representatives of the Palestinian people signed an agreement according to which land west of the River Jordan that was originally part of the territory designated by the League of Nations for the Jewish National Home but which had been conquered and occupied by Jordan between 1948 and 1967, would be divided into three zones. The Interim Agreement on the West Bank and the Gaza Strip defines those zones as Areas A, B and C with the latter being left under Israeli control pending permanent status negotiations between Israel and the PLO. Those negotiations on topics including Jerusalem, refugees, settlements, security arrangements and borders began in 1996 but ran past their target date of May 4th 1999. Following the unsuccessful Camp David Summit in July 2000, the Palestinian Authority chose to initiate the war of terrorism known as the second Intifada. Although negotiations did continue for a time despite the extreme violence, the process was frozen in September 2003 following a major terror attack. In August 2005 Israel implemented its plan of disengagement from the Gaza Strip and areas in northern Samaria. Throughout the twenty years since that interim agreement was signed, numerous attempts have been made to restart negotiations and several plans have been proposed including the Clinton Parameters and the 2008 Olmert Plan. In other words, had the Palestinian Authority wished to do so, it could have acquired control over the vast majority of Area C on several occasions over the last decade and a half by engaging in the negotiations to which the PLO originally committed itself in 1993. Listeners then hear the World Bank representative promote a dubious and evidence-free connection between unemployment and terrorism – although that word is of course not used here or anywhere else in this programme. As a look at unemployment rates and the GDP per capita in PA controlled areas over the last two decades clearly shows, the economy there was actually steadily improving and unemployment was falling when Arafat decided to launch the second Intifada in September 2000. Passing up on the opportunity to properly inform listeners of, for example, the PA’s use of 6% of its budget for payments to convicted terrorists or the connections between rampant PA corruption, the rise of Hamas and the subsequent need for Israeli counter-terrorism measures, Roger Hearing makes do with the following bland tick of the impartiality box. Jorgensen’s reply again misleads listeners with regard to the status of Area C.
Those familiar with the reports frequently produced by the World Bank will not have been in the least surprised by Jorgensen’s misrepresentation of the standing of Area C and his failure to note the fact that its status has yet to be determined and is currently pending the results of negotiations. In October 2013, just as Jorgensen took on his position, the World Bank published a paper titled “Area C and the Future of the Palestinian Economy” which – like many of the World Bank’s other reports – is based to no small extent on material provided by a plethora of political NGOs including Yesh Din, Gisha, ARIJ, B’Tselem, Bimkom and the Land Research Centre. Unfortunately, Roger Hearing failed to correct the inaccurate impression given by his interviewee regarding the legal status of Area C just as he failed to relieve them of the misleading impression that terrorism is caused by unemployment. Moreover, whilst attributing the state of the economy in Palestinian Authority controlled areas to Israeli “restrictions”, Hearing made no attempt to accurately inform listeners what the phrase “major security fears” actually means. Bearing in mind that BBC audiences suffer from consistent under-reporting on the subject of Palestinian terrorism and that stories such as the rise of Hamas in PA administered areas or the seizure of 5 million shekels worth of money intended to fund terrorism in 2014 alone are rarely covered by the BBC, it is imperative for any accurate and impartial report on the Palestinian economy to include such essential background information. This BBC World Service report failed to deliver, instead sticking to a well-trodden but misleading political narrative in which Palestinians are portrayed as passive victims devoid of all responsibility for their choices. The rest of this programme will be discussed in a future post. 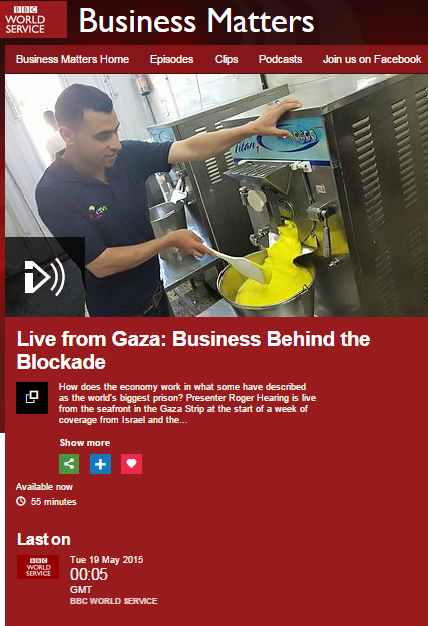 In addition to the ‘Gaza Special’ broadcast on May 19th on the BBC World Service radio programme ‘Business Daily’, the edition of the show ‘Business Matters’ aired on the same station on the same day also devoted most of its content to the same subject matter. In the introduction to that programme, however, listeners across the globe were treated to an interesting and revealing glimpse into the ‘BBC world view’ of the Gaza Strip. Note how Hearing’s “history” ignores the Gaza Strip’s status as part of the territory assigned by the League of Nations for the creation of the Jewish national home. Note too the absence of any mention of the fact that the Palestinian refugees were created because the nascent Israeli state was attacked by its Arab neighbours in 1948 and the euphemistic reference to the Gaza Strip being “run” – rather than occupied – by Egypt. Hearing goes on to present a partial portrayal of Hamas’ terrorist designation and a whitewashed account of the violent Hamas coup which resulted in the expulsion of the internationally recognized representatives of the Palestinian people from the enclave. He then misrepresents the reasons for the closure of the Israeli and Egyptian borders with the Gaza Strip, eliminating from the picture all mention of Hamas terrorism in either country. “The violent Hamas take-over of Gaza took place between June 5th and 15th 2007 and the Palestinian Authority – the internationally recognized representative of the Palestinian people – was forcefully ejected from power. Following that event, both Egypt and Israel largely closed their borders with the Gaza Strip due to the fact that the body charged with joint security arrangements under the terms of the Oslo Accords – the Palestinian Authority – no longer exercised any control over the territory. That misrepresentation of events prepares the ground for Hearing to continue with a blatantly inaccurate portrayal of what came first – Hamas terrorism or the blockade. In fact, that latter claim was shown to be inaccurate in post-conflict analysis carried out a full ten months ago. 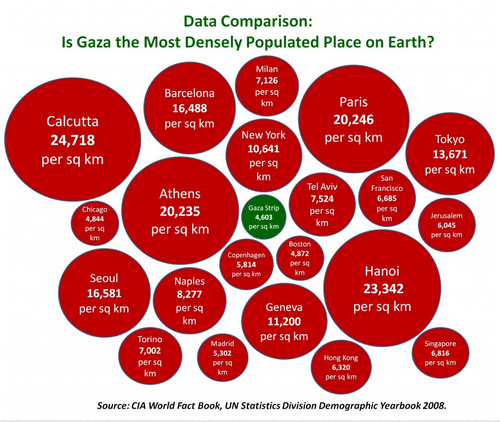 “We find 8,952 of the 12,433 total points (72%) are within a 3 KM buffer abutting the border with Israel. The main objective of Operation Protective Edge was to find and destroy dozens of terror tunnels dug from Gaza into Israel. And to add insult to injury, he goes on to make use of one of the most jaded clichés in the rich lexicon of politically motivated anti-Israel rhetoric. That same rhetoric is also used in the programme’s synopsis on the BBC website. As we see, the BBC World Service has now extinguished any daylight that remained between itself and numerous assorted Hamas-supporting campaigning groups which employ the “world’s largest open-air prison” canard. And as Hearing’s jaundiced portrayal of the Gaza Strip shows, the problem with the broadcaster supposedly committed to accuracy and impartiality obviously does not by any means stop there.